NCCF's 2016 annual report has mailed and was just posted online. 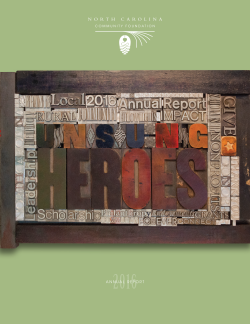 Additionally, a special companion website section is available here that expands on the stories of the fundholders and community leaders, board member, scholarship founder and grantee partner we celebrate as unsung heroes. Issued concurrently with the annual report are NCCF's 2015-2016 Affiliate Profiles and the 2015-2016 Donor List (both as of fiscal year-end 3/31/16) as downloadable PDFs. These documents also can be mailed to you by emailing Lori Johnson or calling 919-828-4387.